On May 3, James F. Checchio was installed as the fifth bishop of Metuchen in an afternoon ceremony at Church of the Sacred Heart in South Plainfield. 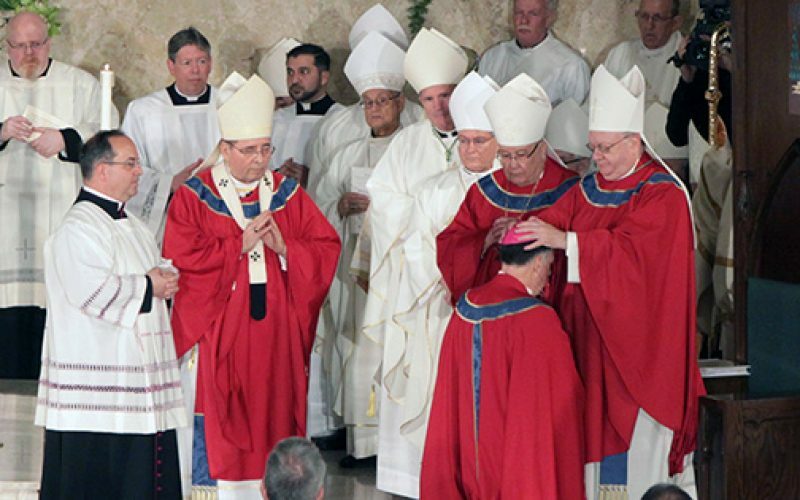 Bishop Dennis Sullivan, as co-consecrator, performs the laying-on-of-hands on Bishop Checchio during the Rite of episcopal ordination. Also on the altar are Archbishop John J. Myers of Newark, principal consecrator, and Bishop Paul Bootkoski, Bishop Emeritus of Metuchen and co-consecrator. Left, Bishop Checchio speaks with reporters during a post-ordination question-and-answer session. 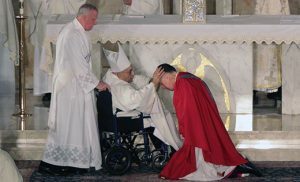 A Mass of Thanksgiving for the Episcopal Ordination of the Most Reverend James Francis Checchio will take place on Sunday, June 26, 12 noon at Our Lady of Hope Parish (Saint Agnes Church), 701 Little Gloucester Road, Blackwood. 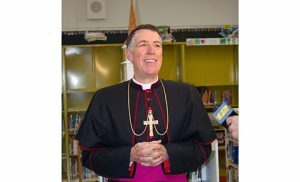 Bishop Checchio, ordained a priest for the Diocese of Camden and now the bishop of Metuchen, will return home to celebrate this Mass with the priests, deacons, religious and lay faithful of the diocese. 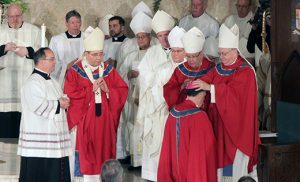 At this Mass the Diocese of Camden will have the opportunity to congratulate Bishop Checchio on his recent ordination. 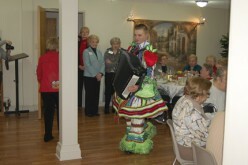 A light reception will follow in the Parish Center. All are welcome. Bishop Joseph Galante, Bishop Emeritus of Camden, during the laying-on-of-hands. With Bishop Galante is Deacon Richard Maxwell. 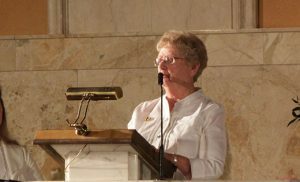 Sister Marjorie Smith, former principal of Saint John School in Collingswood, gives the first reading during the liturgy. 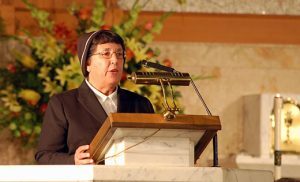 Sister Marianne McCann, principal at Paul VI High School in Haddon Township, proclaims the second reading.